English lecturer Benjamin Vogt is author of the gardening blog "The Deep Middle." The site features gardening tips, photos from Vogt's garden and selections from his published works. 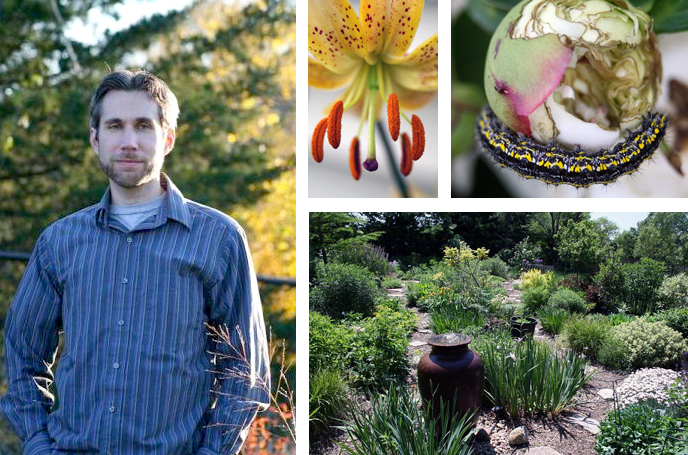 For the last five years, Benjamin Vogt has been writing the garden blog "The Deep Middle." The project started as a way for the English lecturer to simply record the evolution of his garden. However, the blog — an infusion of gardening tips and selections from Vogt's published work — has bloomed into a medium that allows the writer and naturalist to connect with gardeners and writers around the world. The blog, http://deepmiddle.blogspot.com/, has helped establish friendships with garden aficionados from Vietnam, South Africa, France, England, Greece and Mexico. In addition to his traditional gardener following, Vogt has also had visits from best-selling authors. Vogt began planting and developing his garden in July 2007. The main part of the garden is roughly 1,500 square feet at its southeast corner, with additional foundation beds along the back of his house. Last summer, Vogt’s garden was part of a tour, and many of the 500 visitors asked if he offered coaching services. A week later, he started Monarch Gardens, a garden consulting business. Vogt said he also hopes people will garden for kids because there’s so much for developing minds to see, touch, hear and experience. “I’d love to have a part in creating a children’s prairie garden, even posting nature-y poems in the space,” he said. Vogt’s next memoirs are on Oklahoma Territory, Mennonites, the Cheyenne and prairie ecosystems. His blog shares anecdotes about his research trips and family homesteading stories. As Vogt researches plants, he’s come to favor natives because when they’re properly sited, they bring in more wildlife and are easier to care for.